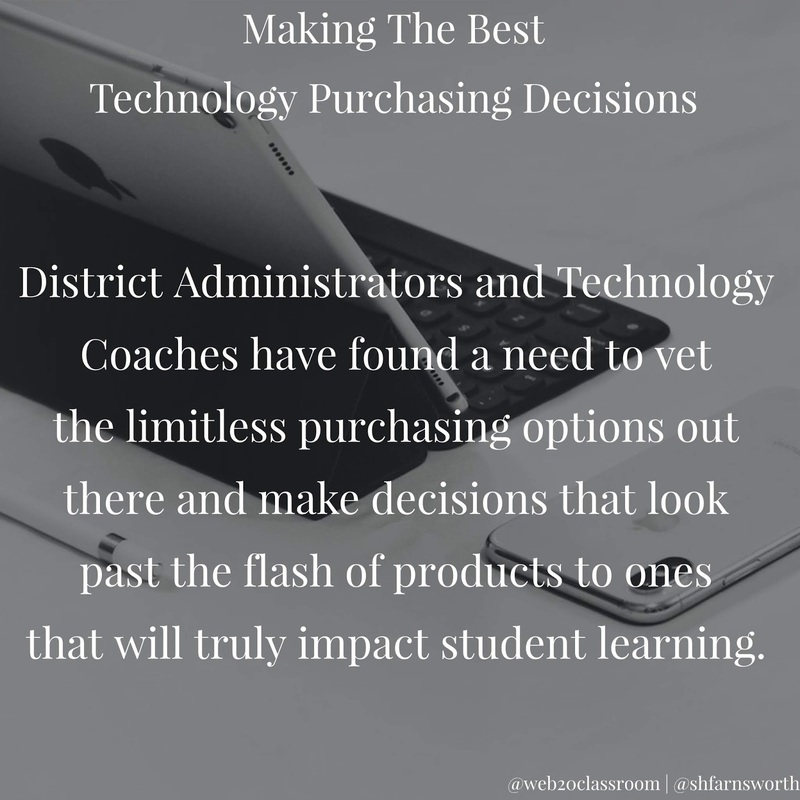 In our next collaborative post, Shaelynn Farnsworth (@shfarnsworth) and I discuss how schools and districts can make the best technology purchasing decisions. Recently I was talking to a Tech Director colleague that was in the middle of a purchasing battle with a principal. The principal had been approached by a well-known technology vendor wanting to sell the school some hardware and software to help students in literacy and math. The vendor was long on promises but short on delivery. The problem was the principal was blinded by the promises of high achievement and didn’t consider how that one purchase would put a serious strain on the district technology department. Balancing a district budget is an annual job that has many administrators prioritizing monies to meet the needs of students and staff, as well as the upkeep and daily operations of the grounds and facilities. The increase of technology use in learning has added an element to the budget which has seen a steady increase over the years. In a 2017 report from Learning Counsel results found districts spent $16.2 billion on hardware, networks and major system software. And these numbers will only continue to rise. 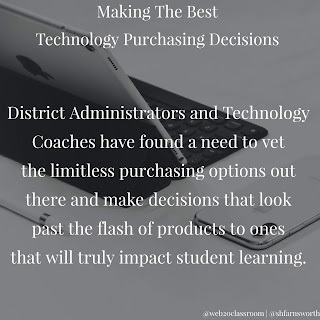 With this understanding, many district administrators and technology coaches have found a need to vet the limitless purchasing options out there and make decisions that look past the flash of products to ones that will truly impact student learning. How Are Student Privacy and Data Protected?- Many of the Edtech products available today require some elements of Personally Identifiable Information (PII). This could be anything from their name and grade all the way to their entire student demographic and academic profile. Educators and Administrators have a responsibility to understand how that data used by the products are consumed and ultimately protected. Reading terms of service is a start but asking questions like how much PII is actually needed for the software to run or how is the data stored or is it encrypted in transit and rest are some of the most basic questions to have solid answers to before allowing any company access to data sources. Check to see if the vendor has signed the Student Data Privacy Pledge. Most importantly, have a solid understanding of how the data is stored and used before signing on the dotted line. What Compatibility and Interoperability Are Available? A common mistake we see made frequently comes from local school administrators making a purchase without making sure it works in the current system. Odds are if you are making a major technology purchase you already have a network and systems in place. Therefore it is important to ask about what devices the software works on or how does the hardware work in your current server environment? You don’t want to have to make additional purchases after the fact or find out that what was purchased won’t work at all because there is a compatibility problem. Where Did The Research Come From? Many Edtech products, especially those used to increase student-achievement, will boast that they are backed by research. But you have to look at this with a critical eye. Where did the research come from? Was it funded by the vendor? Was it the vendor themselves? If products are truly “backed by research” the vendor should be able to provide or you should be able to provide independent research to back their claims. What Is The True Cost For The Hardware or Software? Don’t get burned by additional costs related to licenses and fees. When you are making a major technology purchase what does the license include? Is a yearly cost? With software especially, as lots of questions about the total cost. Often you will have to pay for updates or upgrades. You don’t want to spend a large chunk of your budget on some software for every student only to find out that if you want the next version you’ll have to pay more for it. Do your homework and crunch the numbers to find out the true cost of ownership. How Will You Be Supported? Support is often one of those things you don’t think about until you need it. It should, however, be towards the top your list to understand before making any technology purchase. Do you have to pay for support? If you do, how much do you get? Are you limited to the number of support cases you can open? Who can call for help? When is support available? Is just a certain number of hours a day or is is it 24/7/365? Is the support local or is it outsourced? Understand the support structure before you are stuck needing it. What Training and Professional Development Opportunities Are Available? If you are spending a large portion of your budget on a new piece of hardware or software, especially if it is being used in the classroom by students or teachers, there should be a conversation before you sign about training and professional development. How will everyone be trained? Will it come at a cost or is it included? What about training new users 6 months down the road? Will the vendor provide it or will the district be responsible? Is coaching provided? How about opportunities for deeper professional development that could be provided. Ultimately, you are looking for more than just a hardware/software provider, you are looking for a partner that can be with you for the long haul. Purpose: Does the purchase align with the mission and goals of the district? Does it support attainment of the discipline standards, ISTE Standards, and learning targets? Powerful EdTech purchases are ones that can span grade-levels and content areas for maximum student and teacher use. Student-Centered: Besides options to leverage the differentiated classroom, inclusive classroom, and accessibility options; student-centered focuses on choice, ease of use, fun, and supports learning. Cost: Often times the price tag is a heavily weighted component in purchasing, but don’t forget to factor in: Licensing one-time, or yearly, per student or per school/district, updates included or added costs, replacement fees, cross-platforms/devices, renewal processes, and contracts. Data Privacy and Security: Always understand how student data is used and stored when making any purchase. How will you get data in the product? What is the minimum amount of student data needed for the product to be used effectively? Is it encrypted when it's stored? Educators and administrators have a duty and obligation to keep student data private and secure. Learn more about FERPA, COPA, CIPA, PPRA here. Logistics/Management: Minimal Effort To Get Things Going and Keep Them Going. Will this technology purchase work in our current learning environment? Whether devices, infrastructure, or sign-in, logistics and management are essential to get right. Nothing squashes Edtech in the classroom more quickly than when something doesn’t work, access is complicated, or multiple steps must occur before it is roll-out or available to staff and students. Support: You Should Be Supported. Along with management and logistics as a necessary component of technology purchasing success, an understanding of the support offered is essential to classroom use. Knowing how to access support, who provides the support, and what that support looks like is information that needs to be gathered in the beginning stages. Professional Learning: Continuous Learning. Professional Learning can come in many forms, from onsite training to monthly webinars, knowing how teachers will learn about the possibilities available with a new purchase and how this will be done helps to encourage use and exploration. Are there additional resources available to use? Is there a community of users to connect with? References: Check Your References. Ask for and check references from those educators and districts already using the product or service. While this may not be a top priority for every purchase, connecting with and hearing from districts currently using the product or service may provide an understanding or experienced success and frustrations. Need more help making the best technology purchasing decisions? We’ve created a deeper checklist you can use, copy and modify to meet your needs. Download it here.